Gunpowder was used in Europe since the early Renessaince, and used in China before that. It is said that gunpowder was first discovered by some Chinese alchemists who were looking for the elexir of life. They brought three ingredients, saltpeter, sulfur, and charcoal, together and put them over a fire to melt them together. Not smart. This entry was posted in Uncategorized on May 23, 2012 by Captain Belaq. You all know what happened to the Titanic, so I won’t tell you the story, only how it happened and what could have saved the crew and passengers. It turns out many things would have saved them. Mainly, it was because of the lifeboats. 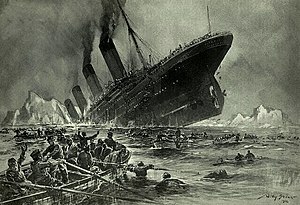 The Titanic was perfectly equipped to carry 64 lifeboats, which each could carry 40 passengers, meaning if the Titanic was equipped with all its possible lifeboats they could carry in total 4,000 people, and only 2.5 thousand people were aboard the ship. The ships owners decided it was only necessary to carry 20 lifeboats. Something else that would have saved the ship, or at least give more time for everyone to get off, is the metal. You remember the Bessemer process? Well, the Titanic was made of steel, and the process that turned Iron into Steel was performed in Scotland. You see, Scotland is very humid, and when the bubbles were run through the molten metal, the carbon would not hook on to the Oxygen because there was already a lot of Hydrogen hanging onto it. So the Iron did not turn into steel, and stayed brittle. I mean, you don’t expect a steel plate an inch and a half thick to bust when hit with a chunk of ice, do you? If the ship had better metal, it would dent instead of crack, and the water would go in much slower, giving much more time for the passengers to get off. And this ship was huge. In the first photo, there is a tiny figure leaning against the ship, underneath the propeller. He looks tiny, as big as this letter: l .And the ship he’s leaning against is not the Titanic, it’s an even smaller ship, the Olympic. 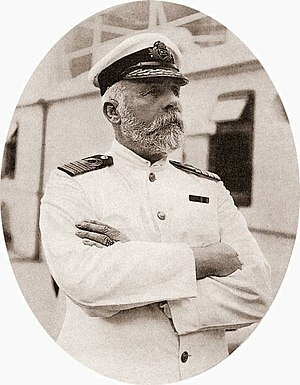 This entry was posted in Uncategorized and tagged Steel, Titanic on May 16, 2012 by Captain Belaq. In my last post, I told you about the Katana and how incredibly awesome it is. Here, or in a few other posts, as it is a long process, I will tell you how it is made. At the Blade-smith’s shop, the pieces of special steel, called Tamahagane, arrive from the smelter. There are two types of steel, one with high carbon content, which makes is hard but brittle, and low carbon content, is tough but not very hard. Both types are needed for the sword. The smith hammers together the pieces of hard steel together (he can tell which type is which by the color: the hard steel is much brighter than the soft steel), folding it over and over, each time doubling the layers of steel, and finally hammering it out into a long, wide bar. He then hammers this into a U shape. Then, he forms the soft steel into a bar about half the width he hammered the hard steel into before he folded it, and inserts the soft steel into the hard steel, whacking them together. What is interesting is that so far, the smith has not formed the blade into a curve: it is still straight! Now the smith begins forming the edge of the blade, it is not sharp when he is done, of course, the actual sharpening will be done with sharpening stones. Now for the heat treating. The smith paints a sort of paste over all of the blade except for the edge, you will see why they do this. The smith darkens the room: this helps so he can see the color of the heated metal, and the heating begins. The forge is heated, with the apprentices pumping at the billows (yes, the apprentices get to do all the hammering too), and the blade is placed among the glowing coals. The smith stays nearby, ready to take the blade out as soon as it reaches a dull, cherry red color. Once it reaches this color, the blade is removed from the furnace and plunged into a bath of cold water. Two things happen when this is done. One is that the blade curves itself. This is because low carbon steel, when heated, expands, and when it is cooled, shrinks. The high carbon steel does not do this, so when the blade is cooled, the back of the blade shrinks, pulling the blade into a curve. The second thing that happens when it is cooled is that when the steel is heated, the atoms inside rearrange their pattern in which they are set, and when the blade is so quickly cooled, they do not have time to go back in their original places, and so the edge turns out very hard but also brittle. However, the paste keeps the parts of the blade it touches from cooling too quickly, and so the back part remains tough. The blade is sent to the sharpener, who sharpens it to the sharpness of a razor and polishes it, showing a wave where the heat-treated and non heat-treated parts meet. Finally, the blade is fitted with a handle, and the finished sword is sent back to the smith, who can now view the beautiful result of his work. This entry was posted in Uncategorized and tagged Katana, samurai, Steel, sword on May 14, 2012 by Captain Belaq. Around the time of Marco Polo, the great explorer, the Mongol Empire was huge, almost twice the size of the Roman Empire. The reason for this was their horsemanship and accuracy with the bow. These horse archers were deadly as they galloped around their enemy while shooting arrows with surprising accuracy. These riders had conquered all of modern day China, and were going for Japan. The Mongols crossed over to Japan and invaded, but the Japanese just slaughtered them. Why did the Mongols not win? Well, Japan is very mountainy, and the horses could not get a good grip on the slope. Also, the Japanese had the Samurai, the elite warriors, the best of the best, who carried with them the “heart of the Samurai” the Katana sword. This sword was the best type of sword in history, it was strong, razor sharp (literally, razor sharp, not as if I mean to say it was sharp, but I mean as sharp as a razor) and beautiful. It could cut cleanly through a piece of bamboo 8 inches wide! This was such a good sword, the Japanese used the Katana in battle from before the Mongol invasion all the way up until World War II. If you give me a comment, or at least a like, I will tell you in my next blog how this sword was made. This entry was posted in Uncategorized on May 14, 2012 by Captain Belaq. Individual atoms are made up of the nucleus at the center, and a series of shells around them. These shells contain a certain amount of electrons. The first shell can only hold two, as the electrons, both being charged negatively, repel each other. The second shell can hold eight, the third can contain eighteen, and so on. Now, one very interesting thing is that atoms love the number eight. So much so, that every element is trying as hard as possible to have only eight electrons in their outermost shell. Now, before I go on, let’s think about salt. As you know, salt is made up of Sodium Chloride. “Wait” you say, “isn’t Sodium one of the Alkali metals? Isn’t it going to explode in my stomach if I eat it?” Well, yes, you are right. And if you inhale a whiff of pure Chlorine gas, one moment you will be writhing on the ground in pain, and the next, dead. Yup, that’s what we season our food with.So here is why we are not dead: Remember in my last post, I said that the Alkali metals have an extra electron far out from the Nucleus, the only electron in that shell. The shell just inside it, however, has exactly eight. And way on the other side of the periodic table, we have the Halogens, which include Chlorine. These Elements each have exactly seven electrons in their outermost shell. So, we have Sodium, an Alkali, trying to get rid of an electron, and we have Chlorine, a Halogen, trying to gain an Electron. When combined, Chlorine sees Sodium’s electron, and grabs it, Sodium lets him have it. The force with which Chlorine grabs it however, is a little explosive, as, you remember, that little electron has a lot of energy. The smoke that comes forth, however, is common table salt.One more thing, you remember the Noble gases? Well, the reason they are so Noble is because they already have eight electrons in their outermost shell, so they are not readily giving away nor trying to grab an electron, making them very stable. This entry was posted in Uncategorized on May 8, 2012 by Captain Belaq. The Alkali Metals are the exact opposite of the Noble Gases. While the gases are inert, do not react, and altogether, well, Noble, the Alkali metals are fun, loud, and explosive. The Alkali metals consist of Lithium, Sodium, Potassium, Rubidium, and Cesium. First of all, the Alkali Metals all oxidize very quickly, meaning they grab the Oxygen around them and coat themselves with an Oxygen compound. Second of all, the Alkali metals are significant because each atom has one extra electron far away from the nucleus. And when put into water, they discover that there is more Oxygen here than in the air, and so they grab onto the Oxygen as fast as they can, the Oxygen grabs back, and that one extra electron, being so far out, has little attraction to the nucleus. The nucleus is the positively charged center of the Atom, and electrons are negatively charged particles floating around it, and everything is held together because of the charge. And so the poor little electron gets pulled over to the Oxygen. And Hydrogen. (As you know, water is H2O). This entry was posted in Uncategorized on May 7, 2012 by Captain Belaq. After the Civil war, research could be done on common Chemistry rather than weapons. And I mean using the elemnts to make electric lights and better soap, not Atomic bombs and chlorine gas. So it was during the breath between wars that some scientists were looking at the chronology of the sun and discovered the spectrum of a new element; Helium. Dmitri Mendeleev, creator of the periodic table, claimed that it did not exist, because it did not fit into any of the columns on the table. In 1895, a man named Lord Raleigh discovered that the Nitrogen taken from the air (after the Oxygen was separated, of course) was more dense than the Nitrogen taken from chemical reactions, and so concluded that there was another gas in the air. Following this discovery, an experiment was made that successfully isolated a new Element: Argon, after the Greek word Argos, or in-reactive. Dmitri Mendeleev denied the existence of this Element as well. William Ramsay, who helped Raleigh isolate Argon, theorized that there must be a whole column of undiscovered Elements, and soon after discovered the Elements Krypton, Neon, and Xenon, after the Greek words Kryptos, (“hidden”) Neos, (“new”) and Xenos, (“stranger”). Finally, Dmitri Mendeleev accepted the evidence of these Elements, and added a new column to the periodic table, the Noble Gases. The Noble Gases are so called because they do not not react very much with other Elements, and so they are the Noble bunch (kind of different from the Alkali group: they explode if you throw them in water). Another interesting fact about the Noble Gases is that if you run an electrical current through them, they glow. This is used extensively in shopping signs; the red ones are Neon, and the blue ones are Krypton. 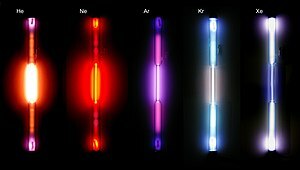 The above photo shows all the Noble Gases: Helium, Neon, Argon, Krypton, and Xenon. This entry was posted in Uncategorized on May 2, 2012 by Captain Belaq.